What it means when your website says "connection is Not secure." | McQuillen Creative Group, Inc. It simply means that you are using an insecure Hyper Text Transfer Protocol (HTTP) rather than the protected Hyper Text Transfer Protocol Secure (HTTPS) to transmit data between your website and its server. Why does it suddenly matter? How is your site affected? If your website address uses the label http:// it will be flagged as insecure. All communications sent over regular HTTP connections are in ‘plain text’ and can be read by any hacker that manages to break into the connection between your browser and the website. This presents a clear danger if the ‘communication’ is on an order form and includes your credit card details or social security number. With an HTTPS connection, all communications are securely encrypted. This means that even if somebody managed to break into the connection, they would not be able to decrypt any of the data which passes between you and the website. 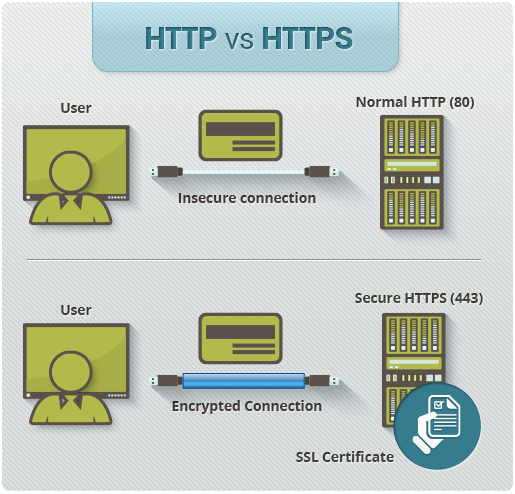 HTTP and HTTPS comparison courtesy of Comodo Inc.
As the names suggest, the ‘private’ key should be kept strictly protected and should only be accessible by the owner of the private key. In the case of a website, the private key remains securely ensconced on the web server. Conversely, the public key is intended to be distributed to anybody and everybody that needs to be able to decrypt information that was encrypted with the private key. When you request an HTTPS connection to a webpage, the website will initially send its SSL certificate to your browser. This certificate contains the public key needed to begin the secure session. Based on this initial exchange, your browser and the website then initiate the ‘SSL handshake.’ The SSL handshake involves the generation of shared secrets to establish a uniquely secure connection between yourself and the website. McQuillen Creative in Aberdeen, South Dakota has been developing and managing websites for over 15 years. Security, reliability, and service help keep your website safe and working. If your website is suddenly not secure, call us for website help at 605-226-3481, especially if your current web provider won’t respond.